Ripples Through Time is Lincoln Cole’s story of elderly Calvin Greenwood as, recently bereaved of his wife Emily and feeling he has no more to live for, he looks back over his life from childhood, through growing up years, marriage, parenthood and into older age. His friend Edward listens to the reminiscing - and the story is presented from the perspectives of the different characters, family members, others, Edward himself, as well as Calvin. A story of memories, relationships, mistakes, hopes, challenges and forgiveness emerges as the intricacies of his life are explained, and the connections between the people in Calvin’s life are revealed. I found Ripples Through Time a thought-provoking and gripping story. I loved the characters – well-defined, believable – and the way the author reveals their backgrounds, stories, and what links them all to Calvin’s current situation. Lincoln Cole’s writing is of a high standard and the book is carefully plotted, moving along at a nice pace with a good amount of intrigue and suspense-building as it goes. I like the way it is told from the perspectives of different characters, and at different times in the past. The examination of grief, regret, forgiveness, aging, and euthanasia is sensitively and empathetically done, leaving the reader with much to ponder. At the same time this is not a sad story, but a realistic look at one man’s life with humor, friendships, and hope. The book looks at all the complexities of life and how all the different situations, our different relationships, reactions, mistakes, and decisions add up to make us who we are. It is the story of how Calvin realizes what matters most in life and his hope for forgiveness and peace. Recommended. Ripples Through Time by Lincoln Cole is a story about Calvin Greenwood, a man in his eighties who is alone for the first time in over sixty years. He is not dealing well with the death of his wife, Emily, and is seriously considering ending his own life in order to be reunited with his deceased wife, the love of his life. Luckily, at this time, a family friend named Edward comes back into Calvin's life. Realizing the danger and despair Calvin is in, Edward spends time talking to his friend and trying to understand the motivations Calvin has to even consider doing what many people would consider unthinkable. But for Calvin, it is the only thing that makes sense in his otherwise lonesome life. Ripples through Time is a beautiful story that tackles the hard subjects of aging, life after death, loneliness, forgiveness, friendship, and a person's right to choose whether or not to live or die. It is a wonderfully written story with vibrant, interesting characters and deep, meaningful conversations that will stick with readers long after the pages have stopped turning. Readers interested in social issues will especially be interested in this story, as well as readers who are dealing with aging or loss. People will understand this story and relate to Calvin because he is so well written and really encompasses the emotions that make so many of us tick. He struggles with the same issues that many readers face, which makes for an interesting and engaging story. 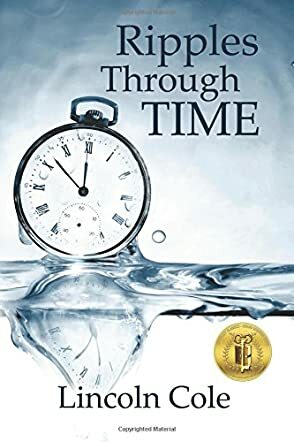 In a lovely and thought provoking new book by author Lincoln Cole, Ripples Through Time is a book that will stay with readers long after they have finished the final page. Follow the story of Calvin Greenwood, an 83-year-old man who has lost his wife and the love of his life, Mellie. Calvin's grief is overwhelming and he can't imagine going on much longer without her, nor does he want to. A good friend of the family, Edward, comes to visit Calvin at his most vulnerable time, and realizes that his friend is considering euthanasia, ending it all in the hope of somehow being reunited with his beloved wife. Will Edward be able to convince Calvin that life is worth living after Mellie? I loved Ripples Through Time. Loved. It. How's that for a review? Author Lincoln Cole has done an absolutely wonderful job in creating characters that his readers will connect with, relate to, and care about. His use of the voices of several narrators is both unique and effective in that it allows readers to feel as if they truly know the thoughts of the characters and can get to know them in-depth. The book provides an opportunity to think deeply about issues including the treatment of the elderly, grief, and euthanasia. Any reader who has an interest in these social issues, or who simply enjoys a great read should absolutely pick up this book. I highly recommend Ripples Through Time, and am looking forward to reading more from the very promising author, Lincoln Cole, as soon as possible!